Bring some flair to your fundraiser with a midway! Everyone loves a carnival, with its games, rides, and sense of whimsy. 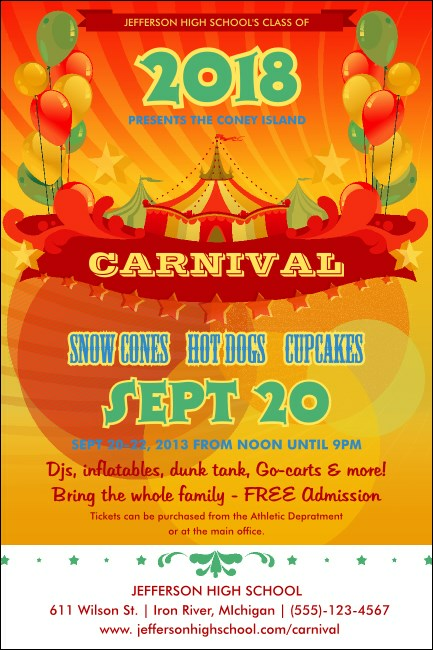 When you're planning a fundraiser or party with all of the above, the Carnival Poster is the perfect choice. Printed in bold colors with balloons, a circus tent, and a nostalgic feel, this poster will draw attention to your cause! All the fun of the carnival can be found at TicketPrinting.com.